Author of The Last Prince of the Mexican Empire, etc. C.M. Mayo to speak on Francisco I. Madero y su libro secreto, Manual espírita, as part of the conference on Francisco I. Madero. Please note: the conference has been moved from Palacio next door to Moneda 4. 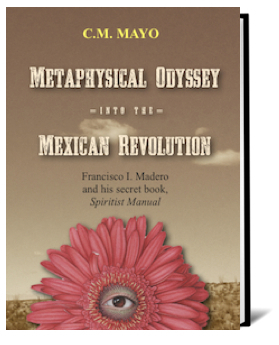 The English original edition, Metaphysical Odyssey into the Mexican Revolution: Francisco I. Madero and His Secret Book, Spiritist Manual, will also be available for purchase and autographs at this event. on the panel "Talking Politics & Religion: New World Texts." C.M. Mayo on the panel "Why Translate? The Case of the President of Mexico's Secret Book"
Read the transcript of this talk here. C.M. Mayo and M.M. 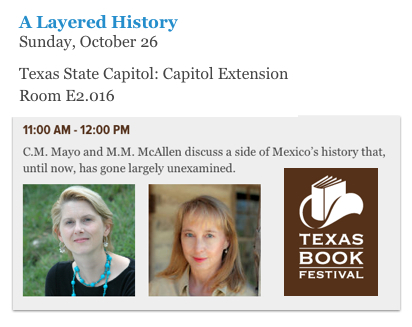 McAllen discuss a side of Mexico's history that, until now, has gone largely unexamined. Take your travel writing to another level: the literary, which is to say, giving the reader the novelistic experience of actually traveling there with you. For both beginning and advanced writers, this workshop covers the techniques from fiction and poetry that you can apply to this specialized form of creative nonfiction for deliciously vivid effects. Salón de homenajes del Recinto a Juárez de Palacio Nacional. This event is part of the conference on the historical novel. "Homesteading on the Digital Frontier: Writers Blogs"
Writers present strategies on how to start a blog, where to get material, how to publicize a blog and add readers and followers, and how to sustain it over time. Other topics: Is blogging a new genre of literature? Why do blogs matter? To monetize, or not to monetize? What are SEO and tagging, and how do you use them? How do analytics help increase readership? How can blogging improve book sales and reading attendance? Should you react to events or pick your own blog topics? Zack Rogow is the author, editor, or translator of nineteen books or plays. His seventh book of poems, My Mother and the Ceiling Dancers, was published by Kattywompus Press. Currently he teaches in the low-residency MFA in writing program at the University of Alaska Anchorage. Mark Doty's eight books of poems have received the National Book Award and the National Book Critics Circle Award. He's also the author of four books of nonfiction prose and a handbook for writers. A new book of poems, Deep Lane, is forthcoming. He teaches at Rutgers University in New Brunswick, New Jersey.